A little while back at an event, some designers, costumers and I were discussing sewing machines—specifically which were the best ones. As a professional sewing machine tech, I was running down my short-list of favorites for them—all older models. In the middle of my sentence, one gifted cosplayer blurted “The best sewing machine is the one you can afford!” which of course, caused the conversation to abruptly cease. It occurred to me that this cosplayer was making a lot of assumptions about value and cost with her proclamation. She seemed to assume one must buy new and that quality is directly linked to cost. It seemed that she assumed that people with fewer means must take the dregs, as if they only had one terrible option at their price point. I am here to tell you that this is not so. In the matter of sewing machines, those fancy high end $15,ooo machines are not the costumer’s machine of choice. Let’s start with the assertion that indeed, the best sewing machine is the one you can afford. It’s the sort of thing that really goes without saying, and was exactly what I was explaining at the time. You can’t sew on a machine you don’t have. However, good machines abound at all price points. Of course, there are definitely machines we’d rather pass up, which was the other point I was making. Here is the inside of a low-end Brother Simplicity. Lots of plastic. No metal frame. You’ll do better with a used vintage machine, and pay less for it, too. Because it is lightweight, this might be great for travel, or for a child to learn on, but not for the hard use of a costumer. Goes for about $116, new. Wasting money on junk is more of a tragedy for the budget sewer. At its worst, it can halt sewing until money is saved up again with which to purchase another machine. It is this fact that led me to my career in sewing machine repair in the first place. I found that it’s best to collect information first, rather than buy two sewing machines like I did. Also, do not rely on old information. You will only end up dreaming of the machine you could have had, or perhaps you’ll be mourning the loss of the big project you can no longer build. I am looking at you, person buying that inexpensive machine everyone has heard of, from that famous fabric chain store—even if it does have “Heavy Duty” printed on it. For sure, the best value is a used machine—across the board, and is usually my preferred choice. A used machine is also quite often better than a new machine. This is because the quality of sewing machines is not what it once was. Price point, and having more stitches than one could ever use, is what is driving sales now. For this article, we will look at mechanical machines, as they are often the best machines out there. As whole, older machines—from the 90’s and earlier—are generally built to a different standard. Back in the day of simple zig zag sewing machines, we expected them to last forever, and generally they did. We bought just one and used it for our entire sewing careers, and then we would give it to our daughters. When the step motor came into use, a whole world of embroidery stitches opened to us, which changed the sewing machine’s role in our lives. It also meant that we needed a wider bite on our zig zag so our designs would not be limited to 4mm wide, and so, stitch quality began to suffer. The addition of an embroidery module with hoop is a whole topic not covered in this article. We are only looking at sewing machines here. 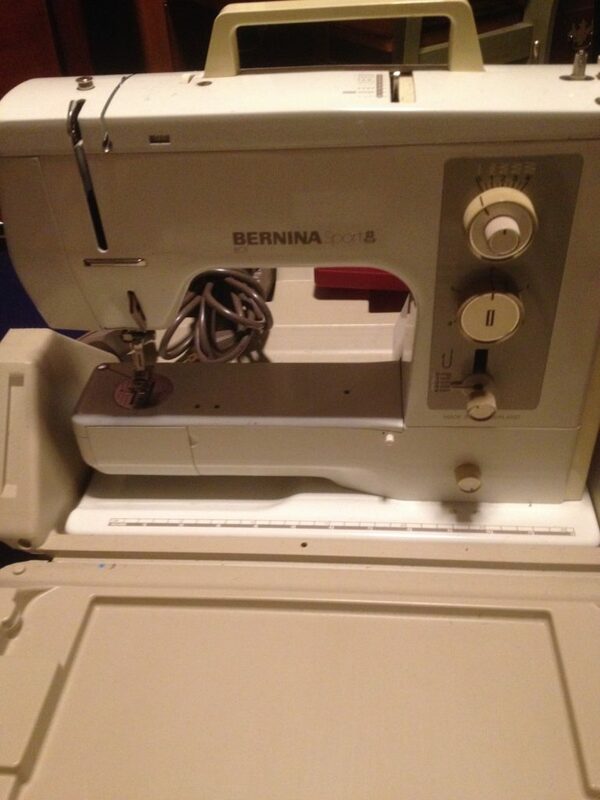 The Bernina 930. Been sewing on mine for over 30 years. It is responsible for making the smoothest piping, the most beautiful satin stitch and the most effortless ripple-free seams. She is my partner, and I owe her a lot. Though most of the older machines are a good choice, there are a few coveted machines that you’d be well served to search out. These include the Bernina 930, 830 Record, 801/801S/802, and the rotary semi-industrial 940 (this is a real dream to sew on! ), all from no later than the 90’s. Currently these can be gotten for about $150 to $500, with the 801/801S/802 at the low end of that scale. If you score one of these in good shape, you will never need another sewing machine. They sew everything. I have even made baldrics out of tooling leather on my Bernina 930. They represent a time when stitch quality was valued, and there was not a step motor in sight. They are absolutely beautiful in design and engineering. 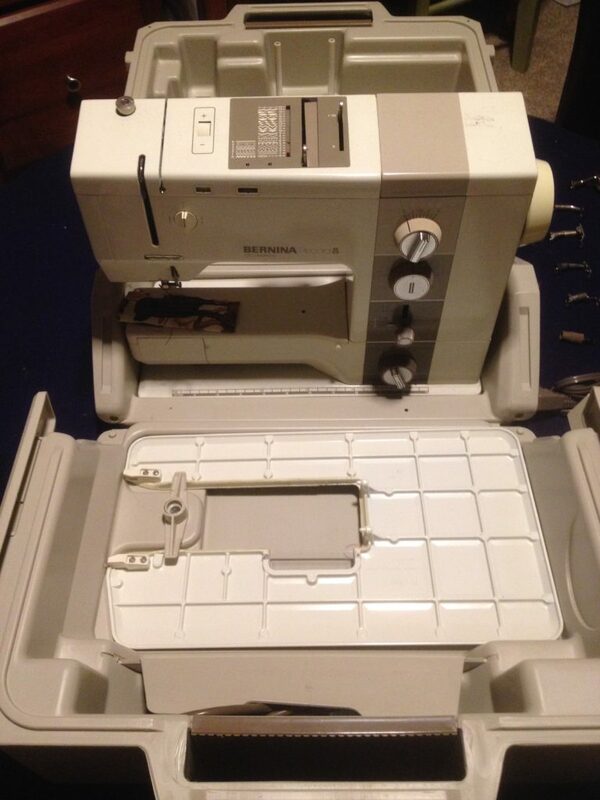 Bernina 801 Sport. The best “little” machine out there. This is what I travel with. Fits in the overhead in a carry-on suitcase. Yes, TSA opens it. There is also a dark red (vs the taupe) version. The 830 Record/801/801S also have no circuit boards, or sometimes only a small one that is easily repaired/replaced if it fails. 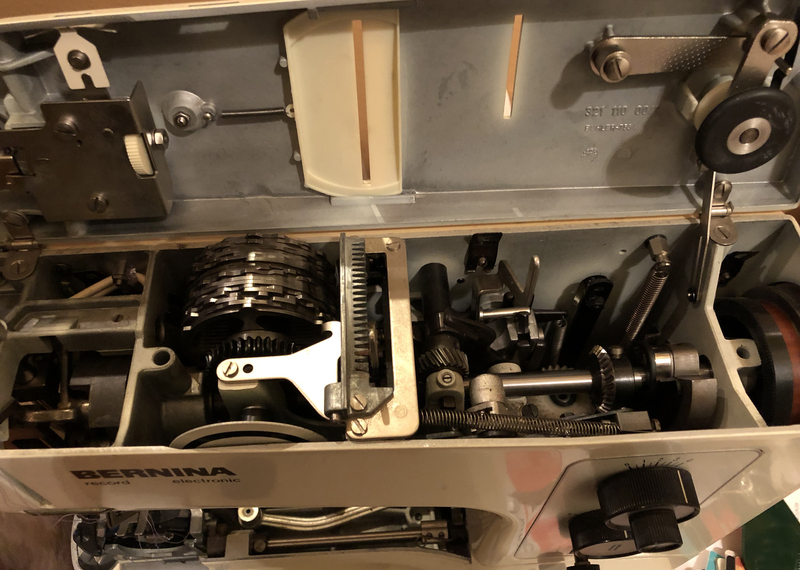 You will still find them, and other mechanical models of Bernina, in professional theater costume shops everywhere because they were simply the only ones that always worked. Pro tip: some of the Bernina 830 Records have a counterweight eccentric that is covered in nylon. These can crack with age and your machine will have issues. The part is no longer available. Pop off the free arm cover and look to see if this nylon is on the counterweight before you buy. 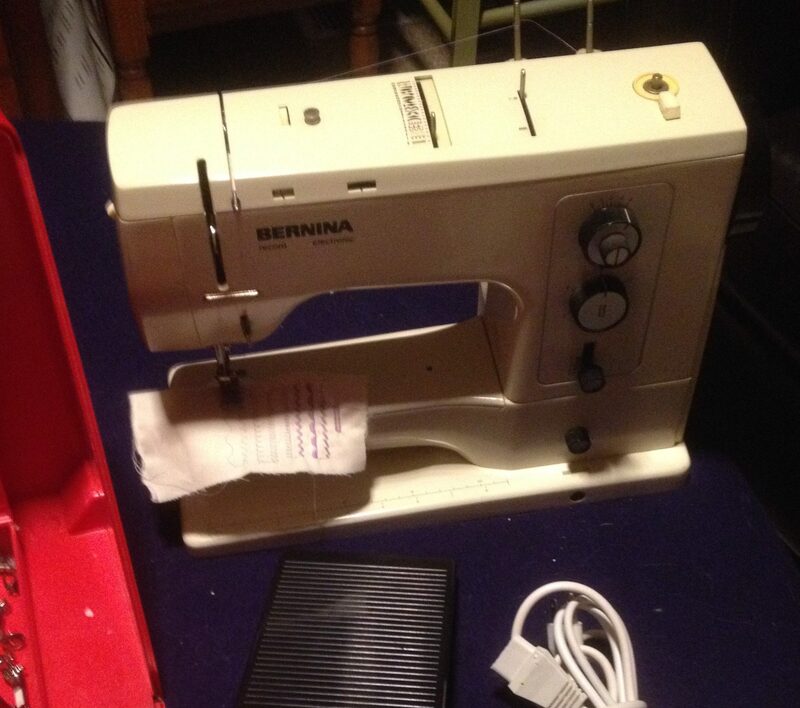 Bernina 830. Probably the most coveted of all machines. It is a bigger version of the 801/802, with more decorative satin stitches. No stretch stitches. Like the rest in the suite it has a killer beautiful buttonhole. The counterweight is in there. Can’t miss it. It is the big round cylinder of metal attached to the bent aluminum crank. Just look at how beautiful this is. The older Pfaffs, like the Tiptronics (the 2020, etc), Tipmatics, and the other machines of that era (spot them by their body shape: all similar to the Tiptronics) are also a good choice, though the base plate circuit boards can be an issue. 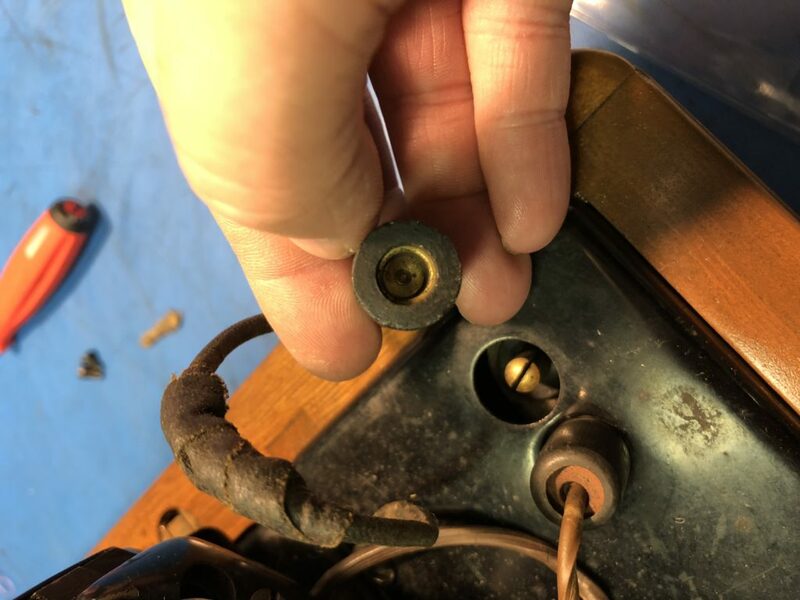 Often, it’s just a loose connection that can be re-soldered. Sometimes it’s more than that. It’s possible to get the circuit board repaired, but at the going rate of $150 for the machine, it’s cheaper to just buy another. 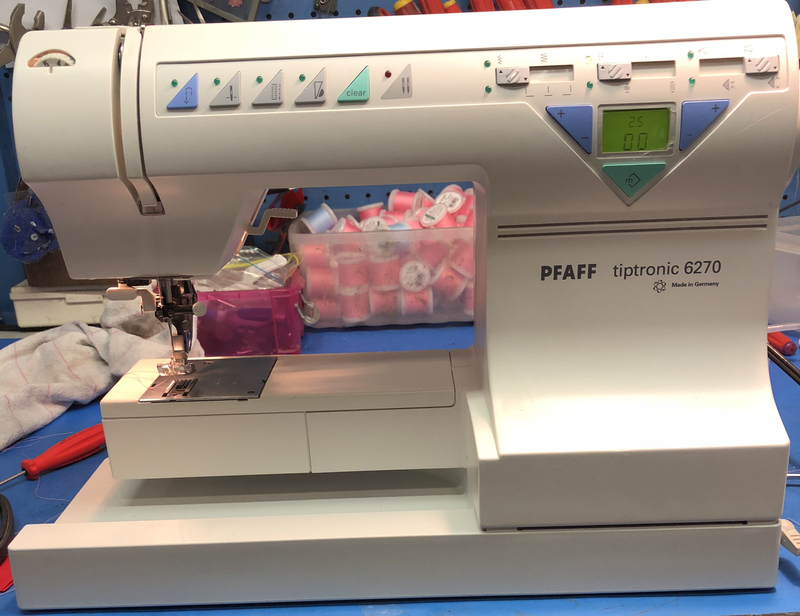 These machines offer a nice stitch quality, are quiet, and offer decent speed. Yes. Quiet matters. You won’t truly understand why until you spend time sewing on a quiet machine and realize how stressful your last noisy machine was. One of the nice little Pfaffs: Quiet, and has a killer buttonhole. This one was made in Germany. Others were made in Czechoslovakia. Another big score is the Pfaff 130 or 230. Built like a tank, and twice as heavy. Find one for about $250. Be sure that all the knobs turn and slide freely. As they age, if they have been tucked away in Grandma’s attic, they will get gummy and stuck. Sometimes they can be freed up again, sometimes not. These machines will sew even the thickest coutille bundle, and are beautifully fast. No ploddingly slow work here! Sears Kenmore from the 70’s or earlier are also a good bet. They are sturdy, simple, and cheap. I won’t list the model numbers as they are not in plain view on the machine, are filled with decimal points and pretty much no two are alike. You can get one for under $50. They all have metal housings, are heavy, and are a great deal. Then there are the wilds of your local thrift shop. Beware. Here there be demons. 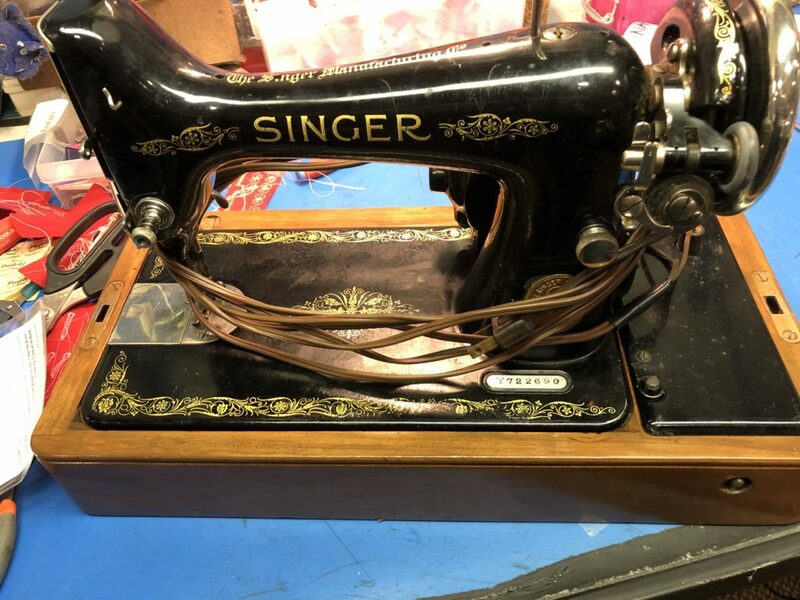 You will find a surplus of Singer sewing machines here, mostly Touch ‘n Sew models filled with disintegrating gears and making ugly y-shaped zig zag stitches—if they sew at all. Occasionally you will find an Athena 2000. If you do, stop and marvel at the 1970’s Radio Shack EC-420 calculator as expressed as a sewing machine, then move along. Let me make it clear that Singer has not made a sewing machine that met my needs since the 1960’s. In general, avoid them. They will usually need all their gears replaced. There are so many other, better machines you could own at that price point instead. The worst offenders are the 600s-700s models. If you see these, hide them, so no one else will have the ill luck of buying them. I am being hyperbolic, but that does not mean that I am wrong. Singer 99k. If you find one of these and you love the look of it, go for it. You’ll need to put a motor kit on it: new motor, power cords and foot control. This model is from 1922, and the wiring, as with all of them, is bad. The connectors are no longer available. Be safe. Replace it all. You may be lucky to find a few gems strewn in with the chaff while shopping thrift stores. 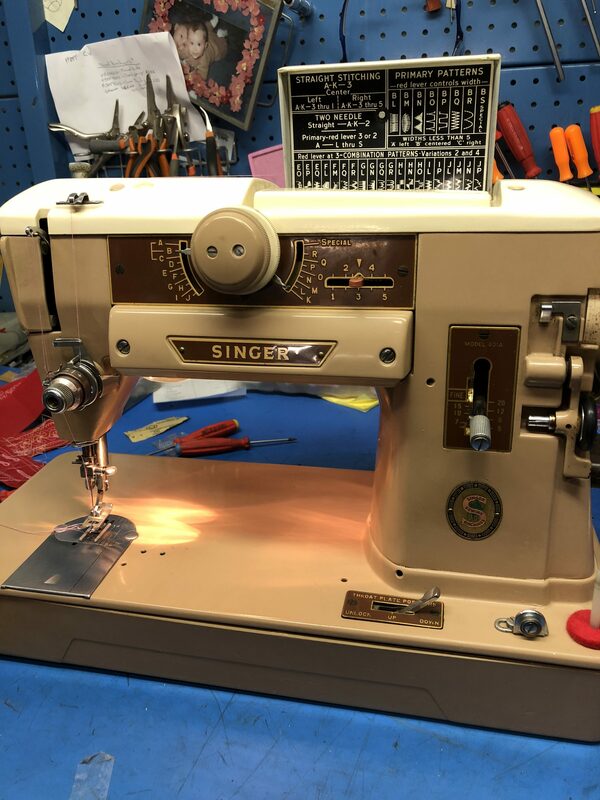 You can still find the Singer Rocketeer (500/503) for about $100, but for far less at the thrift stores, which typically price vintage machines at $50 or less. The quirky shape is endearing, and it’s got a decent stitch with enough power to “make it sew.” The 301 and 401 are also a good choices. The icing on the cake is that there is a guy (or two) on eBay who repaints the the 301s and 221s in all sorts of bright colors. Sewing on a neon purple sewing machine for the win! A bonus with these old Singers is their buttonhole attachment. Sew the same size buttonhole, every time, beautifully. Please skip the 201 as they are too old, and the wiring will be bad. You can’t replace the motor, so it’s pretty much useless. Singer 401, in the Rocketeer family. Pretty good little machine with all metal gears. Use the mechanical buttonhole attachment. 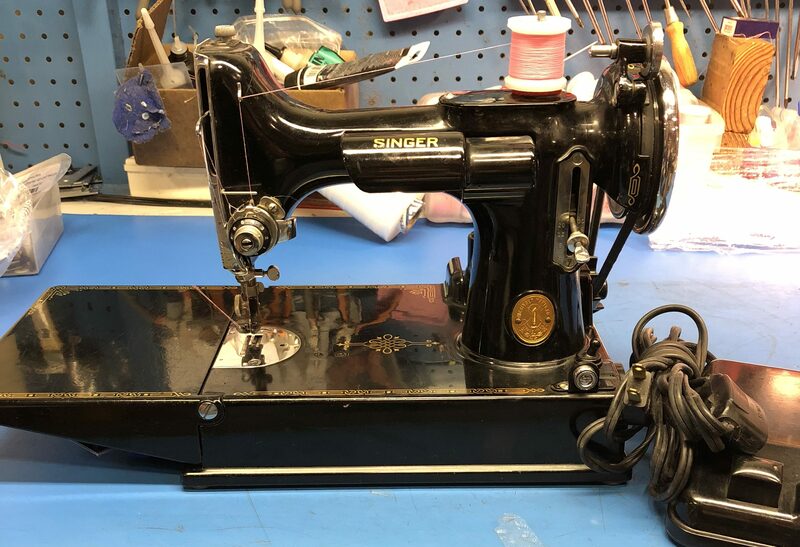 Though not really a costumer’s machine, a discussion of vintage sewing machine would not be complete without the Singer Featherweight (221). It is a favorite of quilters. It’s a small straight stitch machine meant for simple cottons, but might be just what you need if you travel a lot. It comes in a small black box, and is adorable. These are in high demand and command a $250 price tag—the later white 60’s models go for slightly less. The rare free-arm models go for well over $1000. This high demand also means that parts are available, including the motor and hook assembly. There are also a lot of post-war Japanese “badged” machines with names like Fabri-Matic, Good Housekeeper, Vogue Stitch, and Bel Air. Badged machines are simply a machine made for retailer with space to put their own name on it. These machines were made possible because of US economic reform in Japan after WWII, hence the numerous quantity of them. ISMACS has over 5000 badge names in their records, all produced by a handful of makers. Right now, Janome makes most of these low-end machines. 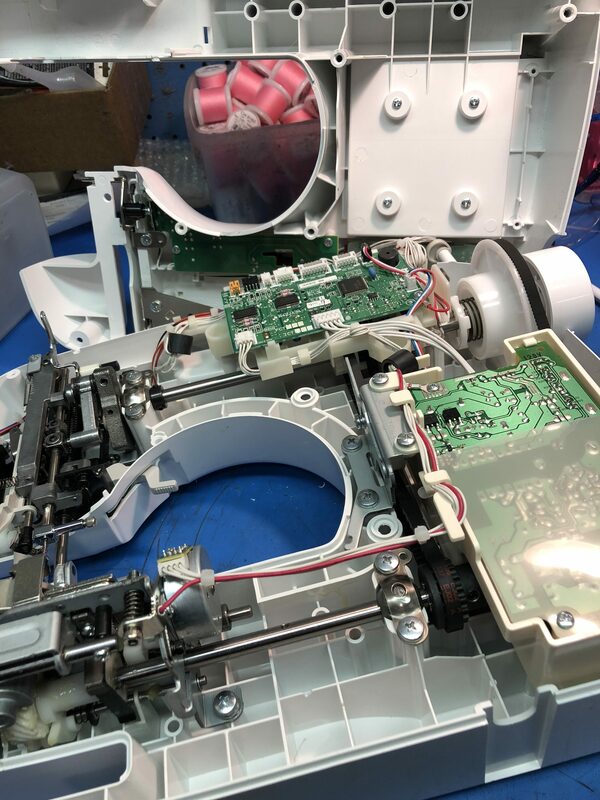 Badged machines, though often noisy, are pretty good buys as you can get them for $25 or less Be picky because some have cracked gears or guides that cannot be replaced. Generally, if it’s a basic straight or zig zag machine, you are golden. If it has fancy stitches, you may still be golden, or you may not have any access to the fancy stitches, which still may be okay for your needs if the price is good enough. There are so many of these types of machines out there that they need to be considered case-by-case. Look closely at these. These are not good machines, but they are bargains that you might even get for free. They often look like a ’57 Chevy dashboard, so they have a whimsy factor as well. Clearly there are a great many good machines at a low price available to us. They are no more expensive than the cheapest new machine, and far exceed them all in quality. Go get that machine you can afford. Just make it one that will be a pleasure to sew on, and not a battle. • Always check to see if there is actually a motor, and that it works. • Check for cracks in the housing. • Check the gears to be sure they are still pliable. • Check to be sure the foot control is included. New foot controllers can be expensive. • Check for rust. Too many machines end up stored in the basement, garage, or barn, to their detriment. • Turn all the knobs to see if they might be broken or stuck. • Check the wiring for crumbling covers, or bare wire. Be sure to look at the wires coming from the motor as well as the power cord. • Plug it in, thread it up, and see if it makes a stitch. • It’s aways a good idea to have a tech service a used machine before you put it into service. What a great article from the person who knows! Thanks very much for the succinct mental shopping list. Thanks for sharing your knowledge and experience. This was a very informative article. I have bought on eBay, but I am a repair tech. Usually things go fine, but I have had machines arrived poorly packed, and I have had UPS run over a machine I packed for sale. eBay is okay, but try for a local auction where you can do a pick up instead of shipping. Don’t buy on e-bay! I purchased a beautiful 1960’s Pfaff from e-bay, but sadly the seller didn’t pack it well and it was pretty beat up when it got to me. Ridiculous e-mails ensued. True, eBay can be hit or miss. Insist that they use UPS and have UPS pack it and insure it. I have done this several times when shipping machines, all with good results. They cannot say it was not shipped properly, as they packed it. It does cost more, but it’s worth it. I went to this after UPS ran over one of my Bernina 801 machines with their truck and insisted it was my fault. There were tire tracks on it. I took a real hit on that one, but I did replace the machine for the customer. I was reading a quilting magazine and an article talked about the Singer Featherweight. 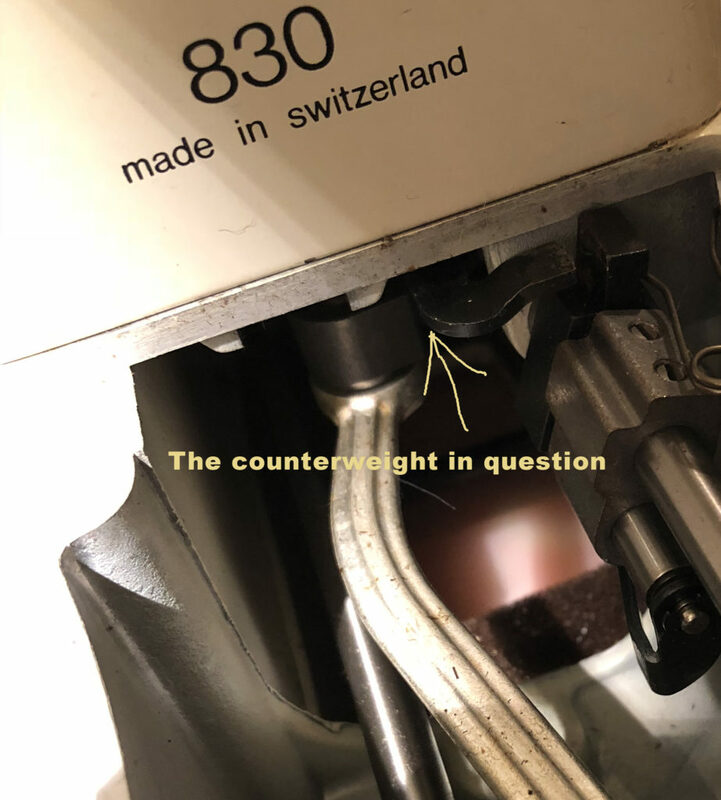 It said the featherweight wasn’t the ideal machine for quilting , because the featherweight should not be used continuously , its motor is not powerful enough for the demands of quilting. It is best used for regular garment sewing. David, that is not true. Quilters love these little machines. The motors are just fine. If, in fact you DO go through a motor (after all, they are over 50 years old, at least), because this machine is so loved, you can get a new motor for it. Alphasew makes them. Love the Bernina 801, 830 . 930 and so on. Very reliable machines made to a high standard not found in the newer modern machines of today.